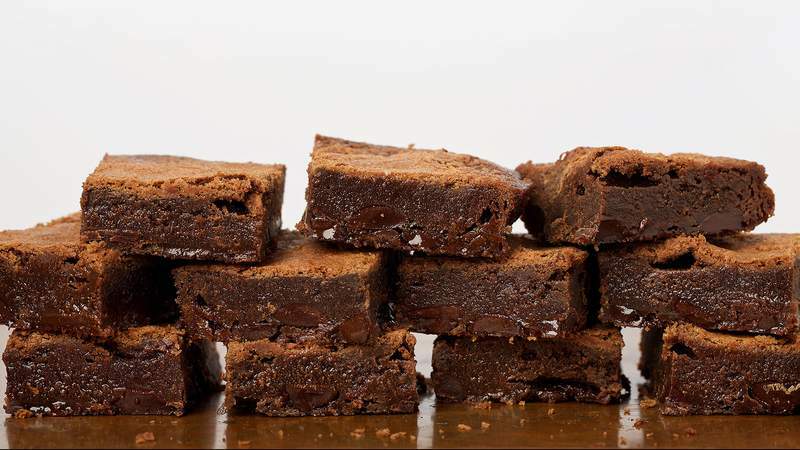 Deb Lindsey | Washington Post Fudgy Flourless Brownies are a tasty gluten-free treat. That pure chocolate flavor is the defining characteristic of these gluten-free brownies from cookbook author Anne Byrn, whose new “American Cookie” book includes a neat collection of treats from throughout the country's history and geography. This recipe includes what sounds like an insufficient 1/4 cup of cocoa powder, but it works. Without a ton of flour to dilute its strength – and with a robust amount of brown sugar, which helps boost the fudgy flavor and texture – all you taste is chocolate. A handful of chocolate chips is another gear in the CDV. Expect the chocolate chips to sink in the batter, which is why the foil sling is so important. The first time I made these brownies, I followed the instructions to use a the greased but unlined pan, and while it was hard to beat the crunchy, caramelized bits at the bottom, I couldn't get the brownies out without basically destroying them. For more texture and flavor, you can sprinkle finely chopped nuts on top before baking. For easier slicing, you may then chill the brownie slab in the freezer for up to 1 hour. Use the foil sling to lift out the brownie slab before cutting it into 16 pieces. The brownies can be stored in an airtight container at room temperature for up to 3 days, or in the refrigerator for up to a week. For long-term cold storage, wrap them in plastic wrap and freeze, for up to 6 months.